Orange County’s highways are some of the world’s most congested, and big trucks are commonplace here. If you’re injured in an accident with a large truck in Orange County, you are much more likely to sustain a serious injury than if you are hurt in a typical accident between two automobiles. Call Orange County truck accident lawyer Chris Purcell right away after an injury. Chris has been representing truck accident victims for more than two decades. He will work hard to hold the guilty accountable and to obtain the compensation and justice you need. In 2013, Chris was part of the legal team that won the largest civil judgment in California legal history for a family devastated in a major trucking accident. Although these are the most common causes of truck accidents, they are not the only ways that truck accidents can occur. If you’ve suffered injuries because of a truck driver’s negligence, speak to Chris Purcell to discuss your available legal options. You may be able to file a personal injury claim to recover damages for your injuries. The federal government regulates the trucking industry to keep the roads and highways safe. Unfortunately, these regulations are often not enough to prevent truck accidents and the injuries they cause. First, drivers must take at least a thirty minute break after the first eight hours of driving that day. Regulations also state no driver should drive for longer than 11 hours per day or a total 70 hours per week. If a driver or trucking company fails to comply with these regulations, they will be fined by the federal government. If the failure to comply with the regulations leads to an accident, both the driver and the company may be held liable for the victim’s injuries. Employers are also required to invest in employee training to ensure that every truck operator has the skills needed to drive safely on the road. Once he driver is properly trained, the company must regularly monitor and evaluate the driver’s performance to ensure it is up to par. Companies also have a responsibility to create a culture where bad driving is not tolerated. Companies should know how to spot bad drivers in the hiring process to avoid any issues later on. If an accident does occur, employer should closely analyze the details of what led to the accident so they know how to prevent it from occurring again. If a driver receives a speeding ticket or some other sort of traffic ticket, the employer should immediately be notified so they can look into whether the driver was acting negligent. Despite all of these regulations, truck accidents still occur on the roads everyday. Because of the massive size of trucks compared to pedestrians or other vehicles, the injuries sustained in these accidents can be catastrophic. If you have been injured in a truck accident, speak to attorney Chris Purcell as soon as possible to discuss your legal options. HOW CAN TRUCK DRIVERS PREVENT ACCIDENTS ACCORDING TO ORANGE COUNTY LAWYERS? Get on a normal sleeping schedule so you are always rested before having to drive. Truck drivers should get at least seven hours of sleep a night. If you are tired on the road, pull over and take a nap if you need to. You don’t need to sleep for hours, just 10 to 45 minutes is enough. Naps can go a long way in restoring alertness and work better than drinking caffeine or taking stimulants. Eat a balanced diet. If you don’t eat properly, you may experience sugar issues which lead to fatigue while on the road. Don’t take any medications—prescription or over the counter—that cause drowsiness. If they were prescribed by a doctor, make sure you talk to the doctor about what the side effects are before taking the medication. Truck drivers can easily prevent accidents by following these tips. But, if they fail to do so and you are injured as a result, you may be entitled to compensation from both the driver and the trucking company. Speak to Chris Purcell as soon as possible after the accident. Compensation may be possible, but it’s up to you to take the first step by making the call and scheduling a free case evaluation. 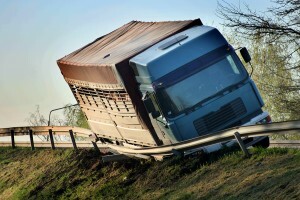 HOW CAN ATTORNEYS HELP TRUCK ACCIDENT VICTIMS? For drivers of automobiles and their passengers, the injuries sustained in a truck accident can be catastrophic if not fatal. In the U.S. in 2012, approximately 333,000 large trucks were involved in traffic collisions resulting in approximately 104,000 injuries and more than 3,900 fatalities. When Chris Purcell represents you in a truck-related personal injury case, he will compile evidence, examine witnesses, and even call on truck and accident experts to provide testimony on your behalf. Chris represents clients throughout Orange County including Santa Ana, Irvine, Anaheim, Tustin, Costa Mesa, and Garden Grove. He has experience representing people in cases involving motorcycle accidents, truck accidents, dog bites, spinal cord injuries, slip and fall accidents, premises liability, and pedestrian accidents. Orange County truck accident attorney Chris Purcell’s goal is to make sure you receive the full compensation you need and deserve for your injuries, lost wages, medical bills, pain and suffering, and property damage. If you’ve been injured in a truck accident, you may be temporarily or permanently disabled. The medical, financial, and personal challenges you confront may seem overwhelming. Chris Purcell is committed to helping you get your life back after a serious truck-related injury and helping you move forward in the most constructive way possible. Personal injury claims are handled on a contingency fee basis, so you pay nothing unless and until Purcell Law recovers compensation for you. To arrange a free consultation with an experienced Orange County personal injury lawyer, please call 714-884-3006 or contact Chris by email today.